Manganapatite: Mineral information, data and localities. Manganapatite was named in 1874 by Max W. Siewert in allusion to its chemical relationship to apatite (fluorapatite). Most manganapatites are medium to dark green and the color is attributed to the substitution of ferrous iron (See McConnel, 1973). 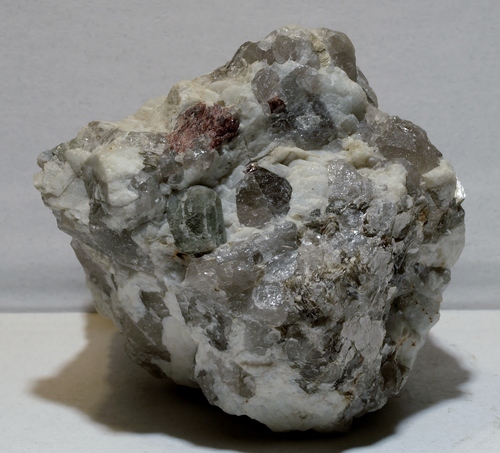 The original manganapatite contained 6.45-6.7 weight percent MnO and was F-dominant. A manganese-bearing apatite from Varutrask, Sweden contained 7.50 weight percent MnO, but was hydroxyl-dominant. Manganapatites frequently contain 1-3 weight percent MnO and are fluorescent in UV. Specimens having >4 weight percent MnO are generally non-fluorescent, but excess iron might also quench fluorescence. If ordering is confirmed in manganese-bearing apatites, then high Mn-bearing specimens might constitute a separate species. 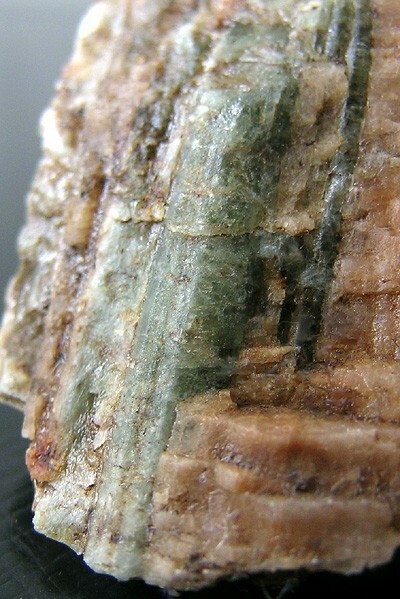 A variety of fluorapatite containing divalent Mn was called maganapatite. Manganapatite is usually a medium to dark green, cloudy translucent, rarely transparent, and fluorescent in UV. Unit-cell dimensions are slightly smaller than pure fluorapatite, while refractive indices are noticeably higher. Crystals are generally short prismatic and frequently are crudely formed. 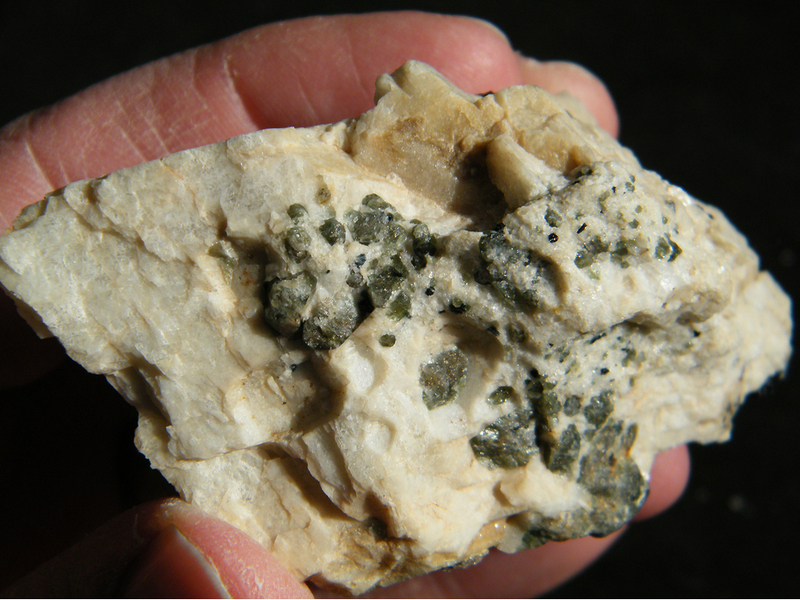 Microcline is a common host with the manganapatite occurring in groupings of sub-parallel individuals. Columbite-(Mn) 1 photo of Manganapatite associated with Columbite-(Mn) on mindat.org. Beryl 1 photo of Manganapatite associated with Beryl on mindat.org. Palache, C., Berman, H., & Frondel, C. (1951), The System of Mineralogy of James Dwight Dana and Edward Salisbury Dana, Yale University 1837-1892, Volume II. John Wiley and Sons, Inc., New York, 7th edition, revised and enlarged, 1124 pp. : 879. Walker, T.L. and Parsons, A.L. (1924) "Pegmatite Minerals from New Ross, Nova Scotia", University of Toronto, Geol. Series, no. 17, pp. 46-50. King, V. and Foord, E. (1994) Mineralogy of Maine. Descriptive Mineralogy, volume 1, Maine Geogoical Survey, Augusta, Maine, pp 418 + 88 plates.